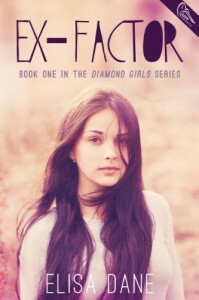 Ex-Factor is a novel I wanted to read for the emotional depth and impact I had a strong feeling it would have. This is a beautifully told story that will resonate with me long after the ending. I couldn't think of a better way to write about the topic of teenage drinking and driving - it wasn't preachy and didn't shove platitudes down my throat, and I appreciated that. I think the less preachy the writing, the more the consequences of the behavior will stick with you. Nev is a character I loved; she's witty and strong with a lot to offer the world. She doesn't feel sorry for herself even after everything she's been through. The problem is, she's so busy beating herself up over her father's death she isn't able to see her own potential. She's drowning in her grief, and I felt every moment of it. I identified with her and knew she was going to have a long way to go. You have to allow yourself to grieve to be able to come out on the other side. I was glad Nev and Bodie had each other to lean on once he stopped giving her the death stare. My only problem with him was the nickname he had for her - "Doll Face." I hoped he'd drop it once they became close. From the way Nev described him, I'd have fallen for him, too. I knew there was a lot more to him than what he showed on the outside. The competitive cheerleading aspect of the story only interested me as far as a way for Nev to deal with her grief and guilt in a healthy way. I didn't mind reading about it since I know nothing about what that world is like, and it served a purpose in the story. I loved Livvie and Erin, the new friend Nev made, so much. They were great for Nev and there for her, just as a cousin and a friend should be. I'm looking forward to the next book to get to know Livvie's story and see things from her perspective.